My kids are at wonderful ages (10, 8, 7, 5). They are out of the baby phase, but not yet to that scarey teenager territory. They also GET things. You know….the older two boys are into sports and were totally into the NCAA Basketball Championship this year (woohoo…shout out to our favorite DI team, the Louisville Cards!!). My daughter also was excited to follow the sucess of the Lady Cards. And my youngest little man is still my music lover and he is forever asking if a show is ‘for grown ups only’. One of the joys of parenting is watching your child’s face light up when they meet someone they admire. And what is even better is when those idols are friendly and approachable. I am forever grateful to all of the current and former Bellarmine basketball players and coaches (especially those connected to the 2011 National Championship team) who have made my oldest two feel like a million bucks when they invite them into the locker room before a game or make a point to call them by name and say hello to them. I like to think of these people as accessible idols. My youngest has had a major thing for Josh Ritter ever since we saw him play an in-store at ear-X-tacy. He was only 2 and in a sling but kept yelling ‘lalas’ during Josh’s performance because that was one of the few ‘words’ he said at the time. We were able to meet Josh afterwards and he was amazing with the kids. They all got high fives and guitar pics from Josh! And it made a lasting impression on my budding musician. My little man has a room full of music posters…including one of Josh’s. He is learning to play guitar and has even composed his own song. When asked who his favorite musician is, he always says “Josh Ritter”. Not that I don’t love Josh, but it always comes as a surprise because he has met and hung out with other talented musicians, like Ben Sollee, The Head And The Heart and Patrick Hallahan (drummer of My Morning Jacket). It isn’t like Josh is the only musician he has met….but Josh clearly stand out in his mind. We surprised our newly turned 5 year old with tickets to Josh’s April 19th show in Louisville for his birthday. He turn five at the beginning of April and (not knowing we already had tickets), he asked us if he could change his birthday to April 19 so that he could see Josh for his birthday gift. So sweet. We will be sitting in the 2nd row and I will probably spend more time watching my little man’s face instead of enjoying Josh’s usual smile, but I am pretty sure they will both be sporting big smiles! If you can’t make the show or just want some good lunch time music on Friday, you can also tune into 91.9 WFPK, where Josh will be playing on Live Lunch at noon (you can stream it live from their site or app, in case you aren’t in Louisville!). It’s gone. And I am totally devastated. Is it weird to have that kind of reaction to a store closing? Maybe. But, ear X-tacy was so much more than a store in Louisville for the past 26 years. It was a community of music loving people and now I feel like our home has vanished without warning. No time to prepare our hearts or say one last goodbye. My head understand that it is a reflection on the changing times in the music industry, but my heart is aching. I could go on for days about what ear X-tacy meant in my life. But what hurts now more than anything is that my kids won’t get to grow up with the embracing, supportive, local music store. Our family has experienced some amazing moments there. 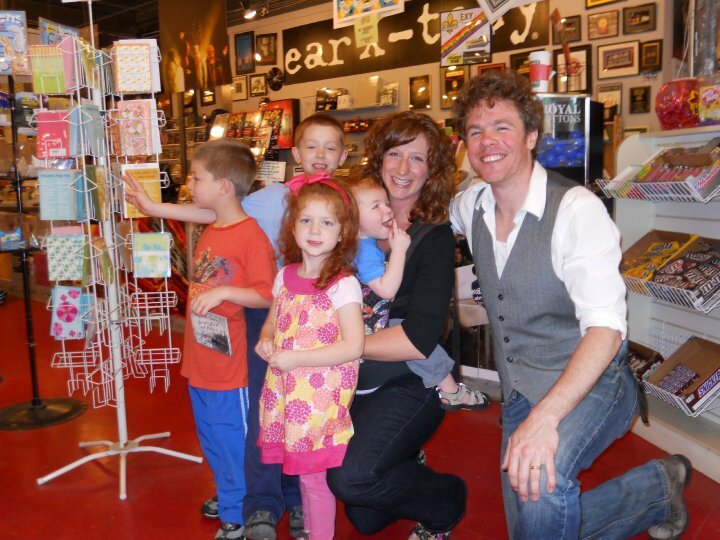 One that stands out strongly in my mind was when Josh Ritter played an in-store on May 17, 2010. I had to sign my eldest, who was in 1st grade at the time, out of school early to make it to the show on-time. It was one of those ‘good Mom vs. music Mom’ moments and I am so glad to say that music Mom won out! My youngest and strongest rocker was just over 2 years old at the time and strapped in the front pack, so that he wouldn’t rush the stage and take Josh down with hugs! We played Josh Ritter’s music on a regular basis at the house (still do! ), so the kids all knew it and my little guy just kept saying, “lala”. He was a very late talker and when he said “lala”, it meant he wanted to listen to Josh. So, to see him perform in the intimate setting of ear X-tacy was mind-blowing for my little 2 year old! But, there is more. We stayed after and got to meet Josh. He was gracious, patient and unbelievable. He got down on his knees to meet each of the kiddos and talked directly to them. He gave them guitar pics. And high fives. My little rocker still talks about the high five! He signed our CD: “to a rock n roll family”. It was an experience my family will never forget. ear X-tacy was so supportive to the local music scene. Sure, they got some great national artists in. I loved seeing Matisyahu and Dawes perform there earlier this year! But ear X-tacy was always there to help the local artists. It was a great family event when we got to see our cousins’ band, Adventure, play there. 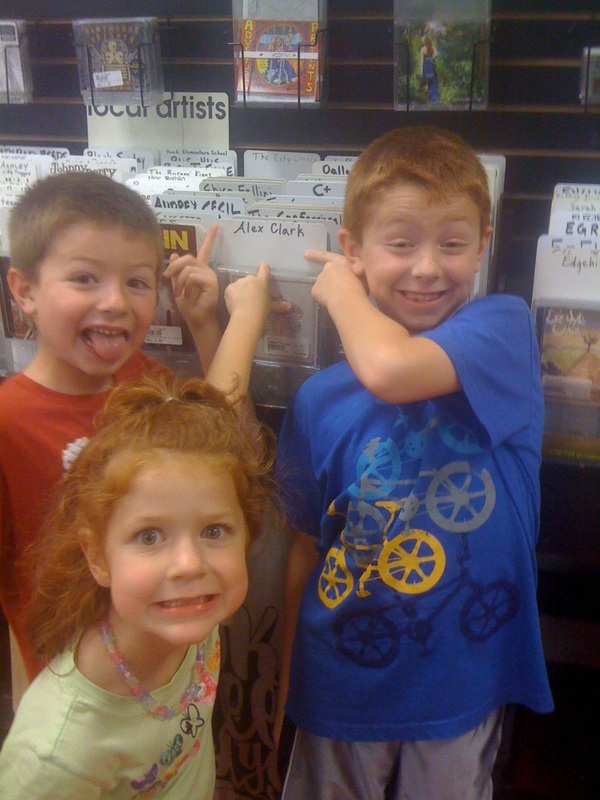 And even more fun when we walked into the Loop store shortly after it opened and found our cousin, Alex Clark‘s CD on display, with Adventure in the background. It is a little hard to watch this movie trailer for Brick and Mortar and Love, knowing that ear X-tacy is no longer…it is exactly what they were trying to prevent. I, too, wish it weren’t time for ear X-tacy to die. RIP. You will be missed more than anyone realizes. You have been an influential factor in the lives of so many and I wish Louisville didn’t have to let go. I am sure I will get to the point where I can look back and be happy about my time and experiences at ear X-tacy, but right now, I am just too sad to think of anything other than the hole ear X-tacy’s departure is leaving in the community and future. I was counting on my little rocker growing up with ear X-tacy and fulfilling his often talked about dream of performing on their stage. It was one of the first things he asked about when I told him it was closed…”what about the stage? I want to play there. Will bands still play?” No, my sweet boy, they will not. I hope somehow that the Louisville music scene can come together and move that stage so that it doesn’t get lost forever. Pulling an all-nighter in my mid-30s. Hell yeah! Why Does It Have To End Like This?! Beady: Young Louisville talent with a big weekend ahead! Christmas Memories and a Playlist!